After a really tense game with nail biting last minutes, Zenit St. Petersburg got the 80-77 win over Bayern Munich for Group C.
Despite a ten points lead at half time (47-37) for the hosts, Bayern was trailing by three (63-60) at the end of the third period and got a 75-74 lead with 3,5 minutes left thanks to Alex Renfroe. That was the last time that the guests had the upper hand. They scored just two more points in the time left and Zenit secured the win. The best that Bayern could do was make it a one point game (78-77) with 22 seconds left thanks to Reggie Redding (11 p.). Sergei Karasev sealed the outcome in the closing seconds with two free throws. 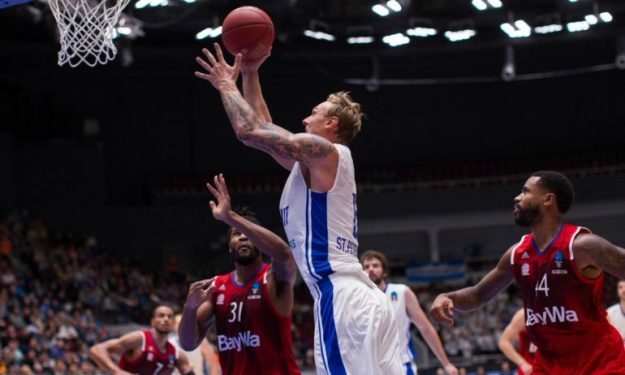 In total Karasev scored 16 points, while Janis Timma was the top scorer of Zenit with 20 points. Devin Booker had an amazing game for Bayern (27 p., 8 r., 5 as.) and Danilo Barthel added 12 points.